Play at G’day casino for the next 10 days for the chance to win a PlayStation 4 and other great prizes thanks to the release of NetEnt’s Football: Champions Cup. If you’re looking for a break from the blackjack tables, and want a chance to be rewarded while you’re at it, head over to GdayCasino.com and play the new pokie from Net Entertainment. If you don’t think you will make it as one of the top 10 players to wager on the new pokie, you won’t miss out with 100 free spins on offer for players to use on Football: Champions Cup. Players can opt in to receive up to $200 matched by 200%, and 100 free spins up until May 25, with a minimum deposit of $20 required to qualify. While we generally prefer the blackjack titles from Net Entertainment, the new pokie is worth a spin – especially if you’re gearing up for the UEFA Euro 2016 which kicks off next month. An interactive feature added to the reels sees players given the option to choose which team they want to play for from the Cup qualifiers. If you don’t follow, you can opt for a random team to be selected. The game doesn’t change much when opting for different teams, but you will notice slight graphic variations. There’s 5 reels, 3 rows, and 20 paylines to play with and roaring crowds surround you as you spin. There’s also a Free Spins feature and another Bonus round to activate. Trigger the Free Spins Tournament by spinning three Free Spins symbols, and here the knockout stage commences. There are four rounds of free spins to correspond with the rounds including the Last 16, Quarter Finals, Semi Finals, and the Finals. Each round will award you with six free spins, each featuring Scoring Wilds which will award you or your opponent goals. During the free spins, your aim is to win, with cash prizes – along with the coin payouts scored from the free spins – awarded for first, second, and third place. There’s up to 500x your stake eligible to be won here. There’s also the Penalty Shoot-Out Bonus, triggered by spinning at least three Bonus symbols where you will be taken to a Pick Me type bonus featuring five rounds. Players pick the positions to shoot a goal and also act as a goalkeeper too. Cash prizes are awarded for scoring goals and multipliers are applied for the saved goals of up to 16x. 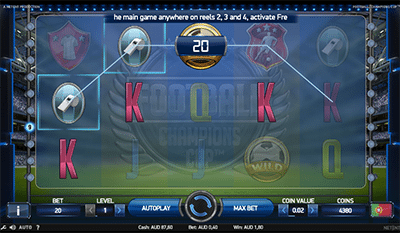 There’s added Wilds and great payouts in the base game too, so if you are looking for a new title to try other than real money blackjack, we recommend trying Football: Champions Cup. Sign up to G’Day casino today if you haven’t already and you can also take advantage of the unlimited welcome bonus.